Seriously though: I have probably done more writing about photography in the past two months than ever before in my life. It’s all because of my involvement in a new project, Camera-wiki.org. What is that? Well, it is a free, user-written encyclopedia which tries to document all of the world’s cameras. 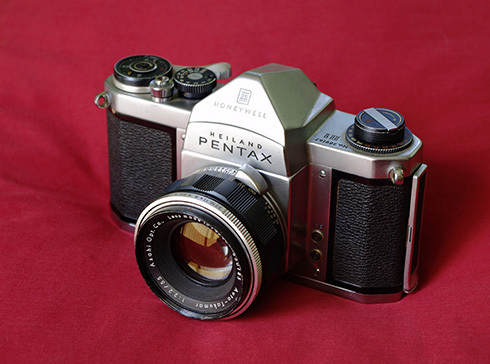 Heiland Pentax H1. My first SLR—and now, a wiki illustration! Does that sound eerily familiar somehow? It should. For the past five years or so, there was a project called Camerapedia.org which had the same goal. Founded as a wiki, Camerapedia was entirely created by volunteers. Naturally this meant there were all kinds of omissions and rough pages, but it was still a very cool idea. Your humble author even contributed a few articles, like one about the tiny little Yashica-44 twin-lens reflex, made for 127 film. The site’s founder had been hosting and maintaining all this on his own dime for a number of years. Eventually something had to give. Unfortunately, the “solution” was a back-room deal to sell the site’s URL to the company Wikia, who would take over all hosting and maintenance. Wikia is a wiki farm: A company that hosts wikis, and makes money from their site traffic by placing advertising on their pages. If you want to start up a Muppet Wiki, Wikia will give you a page template, maintain the software—then kick back to profit from the page views your user-created content attracts. Things get more sinister when Wikia notices an existing, thriving wiki, and approaches the owner of its domain name. That tiny handful of letters is the conduit for every inbound link on the internet; it can represent a lot of traffic. It’s worth cash. While it’s pointless for me to speculate on motives, suffice to say that in January, 2011 “camerapedia.org” stopped existing as a site. Instead, that URL now directs to “camerapedia.wikia.com.” Wikia controls the page layout & fonts the public sees, and can change those at will. Their placement of ads can be quite garish and distracting. Needless to say, this business model has attracted its share of critics. None of Camerapedia’s volunteers had any input about the sale. The howls became deafening. So if you’ve missed your Silverbased fix, there is a new place to look. 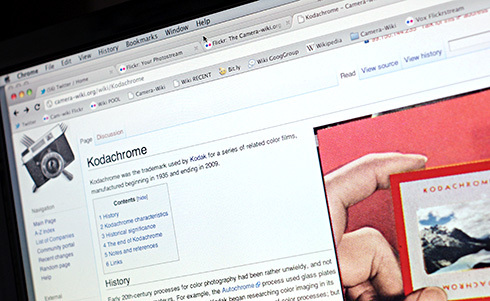 If you appreciated my Kodachrome tribute, I’m proud to have created a whole new wiki article about the legendary film. If you dug some of my techier pieces, I’ve added lots of details the wiki article on “Film.” Of course, since the site is a wiki, both those pieces have since been mercilessly red-penciled by one of Camerapedia’s other editors. If you follow those links a few months from now, other authors may have expanded them even further. Camera-wiki also has its own blog. Besides general site-news updates, sometimes I post an interesting story unearthed from the pages of the wiki. No, it’s not me that needs the help (although some friends would disagree). If you click the random article link at Camera-wiki.org, you’ll find many attractive and well-researched pages… and others that aren’t. As a volunteer project, there are still lots of incomplete sections. Some article authors have native tongues other than English, so you might find some choppy prose. Surprisingly, certain whole brands (Leica!) have very uneven coverage. So we’d be happy to have your help. If you own some uncommon old cameras, look at their pages in the wiki. If needed, we would love for you to contribute a good photo to our Flickr group (and join the discussions there). If you want to help add information to an article, or phrase it more clearly, you can create a login and have at it. The wiki markup syntax to create pages is a little funky behind the scenes, but we have some help pages and a FAQ to get you started.